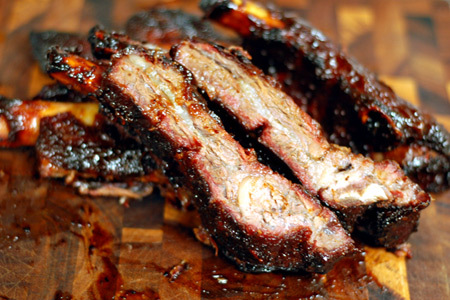 Who Doesn't Love Beef Ribs? It's no secret that I absolutely love my Pit Barrel Cooker. 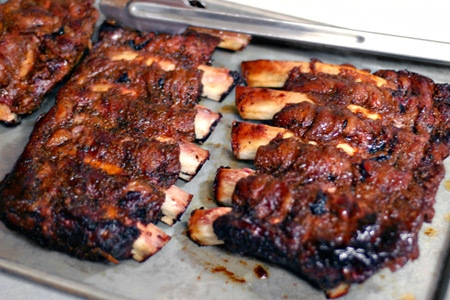 The thing is brain-dead easy to use and it produces some seriously righteous barbecue. Last weekend I ran across some decent beef back ribs and I took the opportunity to spank them with the PBC love. I love beef ribs. I'll take one good barbecued beef rib (OK, maybe two) over an entire rack of pork ribs any day. The problem is that good beef ribs are hard to come by these days. However, there are a few times each year where you can use the power of mass marketing to your advantage. Just wait until after any holiday where people might serve prime rib or ribeyes. It just so happens that Valentines Day is one of those times, so I capitalized on it not once, but twice. I found some decent ribs that weren't trimmed to oblivion (as they typically are) and at a price that was just this side of shoplifting. This isn't really a recipe, I just wanted to tell y'all about my cook. I busted the ribs out of the pack and hit them on both sides with a moderate coat of the Pit Barrel Cooker Beef & Game Rub. 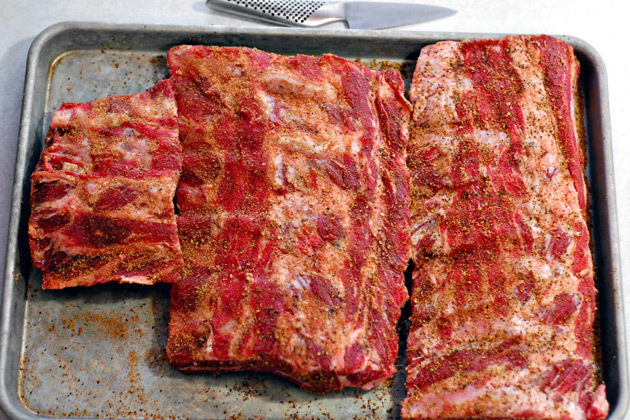 I let them sit at room temperature while I started the Pit Barrel with Kingsford® Original briquets (20 minutes). I hung and cooked them for 90 minutes. Then I wrapped them in a double-layer of heavy duty foil with a little beer and cooked them on the grate (rods inserted) for an hour. Next I unwrapped them and cooked them on the grate for about 30 minutes while glazing them on each side with sauce. I removed them from the barrel and let them rest. ...just long enough for me to whack them up. Then I ate a whole mess of 'em. They were divine! I also took some across the street to my Texas-native neighbor and he said that they were "really good". That's about all the quality assurance I needed. Have you been adding any wood chips to your PBC for smoke? Also wondering are you using a full charcoal basket every time, even on things that wont take 5 hours to cook? Aaron - I have used chips, chunks and Mojobricks in my PBC. Just go easy and experiment. As for charcoal I use a full load for longer cooks and I adjust accordingly for shorter cooks. I've found that it runs hotter with smaller charcoal loads. Oh my gosh these look so good. I need to play with beef ribs more often. 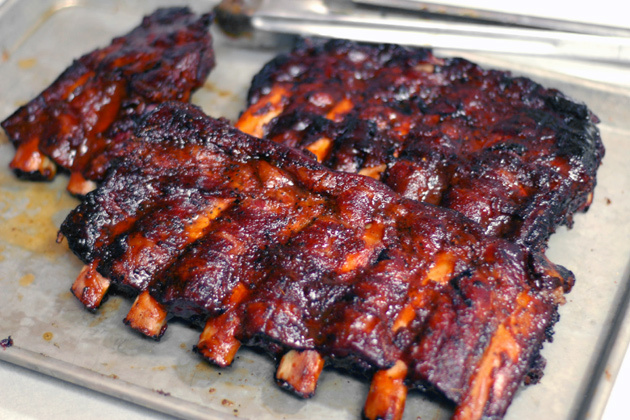 If you like them better than the baby backs, there must be something to it. Nice post, John. You've sold me on the beef. I'm with you John, I prefer a nice rack of beef ribs over pork ribs any day of the week. I did my first cook on the PBC a few weekends ago, your ribs def. turned out better than mine but I'm getting used to mine :). Really loving the cooker though! i just saw an article about you on the news. This is great. i missed the first part. Where are you located? What a great idea! Anonymous - Thanks for the very kind words, but that's not me. The Pit Barrel Cooker Company is owned and run by my friends Noah and Amber Glanville. I saw the segment and thought it was great. The Glanville's are good peeps, and their cooker is outstanding. Get one! WOW! Those look fantastic. I made these once but they did not look nearly this great! I am curious about smoking ribs on the pit barrel smoker. I usually run my smoker at 225 for a low and slow smoke. From what I have seen, the pit barrel smoker runs hotter than that with the avg temp being around 275 or so. Do you think this is too hot for getting tender ribs? Dont get me wrong, I will be getting a pit barrel. I just wanted to get your opinion about how it would work for low and slow pork ribs. Thanks. I would like to add to the above comment... it seems a lot of sites recommend 225 for low and slow. And despite your love of the PBC, at least 2 separate times you mention that some chicken seemed dry. (to be fair, the first time was your first cook on it, and the other mention was your first competition in quite a while. So those things very much could be the reason more than the cooker itself.) However I would think a symptom of the higher cooking heat could be dry food. What are your thoughts? Thanks. Anonymous - Long ago I abandoned low-n-slow cooking in favor of a hotter and faster approach (about 275*). Any new cooker requires getting used to, and that what happened with my early experience with the PBC. It is far and away my go-to cooker both at home and in competition. The new baked porcelain-enamel coating along with the other design improvements take an already outstanding cooker to yet another level of excellence. 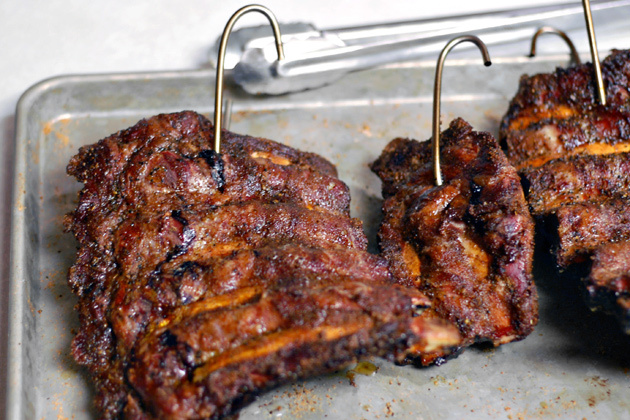 While you grill the beef ribs, after removing the foil, do you put the lid on the PBC and only remove it when you want to brush on sauce, or, do you leave the lid off for the grilling step? Anonymous - I can't recall, but pull the rods out and leave the lid on. That works to give you a nice searing effect without worrying as much about scorching the ribs. You still need to keep a close eye on them if you're using sauce.